A simple and healthy snack alternative for your kids during the season of sugary treats. 1. Slice the top off a navel orange. Grab your serrated spoon and start scooping the orange out of the orange peel, much like scooping out a pumpkin. Be careful not to tear the orange – they are pretty fragile. When you’re done scooping, you should have an empty orange skin. 2. Take your knife and carefully cut a spooky face out of your orange skin. 3. Using your melon baller, scoop your 3 melons into balls. 4. 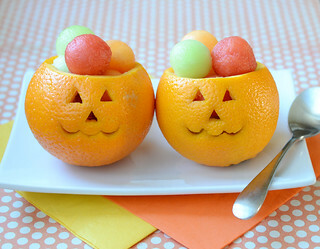 Fill your empty orange jack o’lantern full of melon balls. Enjoy this super spooky and super healthy Halloween treat! I bet all your little ghosts and goblins (and paper bag princesses) will love it.